For any facility which houses important equipment or where money is frequently changing hands, reliable and comprehensive video surveillance is an important and necessary security feature to implement. 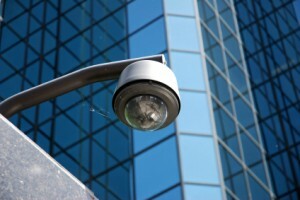 However, not all surveillance cameras are created equally. Traditional point-tilt-zoom (PTZ) video cameras are limited in scope which prevents security managers from gaining a comprehensive view of their facility. 360 degree video surveillance cameras offer the ideal solution. A 360 degree video surveillance camera. When you need comprehensive surveillance over an entire area, you need to be able to capture reliable images that are clear and easy to analyze. 360 degree cameras capture a much larger field of view than other available models, which means less risk of blind spots. In addition, their advanced technology allows them to automatically flatten the image so that faces and figures are easily identifiable. 360 degree cameras also allow you to zoom during both live and pre-recorded video. Because they are able to capture such a wide area, facilities need fewer 360 degree cameras than would be needed if PTZs were used. Generally speaking, only one 360 degree camera is needed for every four PTZ cameras. Fewer cameras means a lower up-front cost as well as minimized maintenance, service, and support costs. In addition, because 360 degree cameras are stationary, there is a much lower risk that parts will wear out so they generally have a much longer lifespan than other types of video surveillance cameras. Thanks to their fisheye lenses, 360 degree video surveillance cameras require minimal bandwidth as compared to PTZ cameras because frame rates are kept low during times of inactivity. Because PTZ cameras are stationary, they are only able to capture a portion of the action in your facility. 360 degree cameras, on the other hand, offer the control of a wide view of an entire area, which enhances your situational awareness and the ability for security teams to respond to issues. This entry was posted on Thursday, April 7th, 2016 at 11:40 am. Both comments and pings are currently closed.